A Tangled Gilded Age Love Story Unfolds. 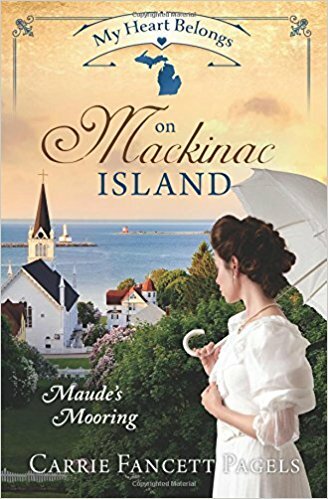 Although the Winds of Mackinac Inn has been in her mother’s family for generations, Maude Welling’s father refuses to let her run it without the guidance of a husband. So she seeks to prove her worth and independence by working incognito as a maid at the Grand Hotel. Undercover journalist Ben Steffans, posing as a wealthy industrialist, pursues a story about impoverished men chasing heiresses at the famed hotel. While undercover, he becomes attracted to an intriguing maid. By an act of heroism Ben endears himself to the closed-mouthed islanders—including Maude—and he digs deep for his story. But when scandal threatens, will the growing love between Maude and Ben be scuttled when truths are revealed? Firstly thanks to Netgalley for my review copy. I have read a couple other My Heart Belong books this year all set in the west and more westerns. It was refreshing to have a different location and era. I really loved the story. It made me want to go there and see the island and to also taste some of the famous fudge. Maude wants to run the inn that has been in her family for generations but her father thinks she needs to be married. When the man she hoped to marry breaks her heart she sets about trying to prove herself to her father. On the flip side Ben is posing as a wealthy industrialist when he is in fact a journalist who is trying to expose how men come to the island pretending to be rich to snare a heiress at the famous hotel. Ben is really struggling with his assignment as he feels more comfortable with the locals than the wealthy. He has a story that has scarred him. As both Maude and Ben seem to be coming closer there are issues arising they need to deal with. I loved the different area of America which I haven't read about before. The places are real with the story fiction, and we get a feel of what it would be like to live on the island. Also what it is like when you live year round on a place where in the summer the wealthy will come and stay at The Grand or other Hotels. It then becomes very much a division of the people. There are also other issues that both Maud and Ben have to deal with, which added to the story. I really loved the story and have heard Carrie will be writing about one of the other characters in an upcoming book. Thanks Narelle! I hope you get a chance to read my novel soon! Blessings! Hi Jenny! Will try to post s comment again. Thanks so very much for reading and reviewing Maude's story! You need to visit up North the next time you come to the USA!!! What I love is that its a real place and a real hotel etc plus a place I know little about. I have a couple of friends in Michigan but no where near here. Yes you will have to take me. Thanks for dropping by Carrie.